Queen of Mayhem: Stab me. 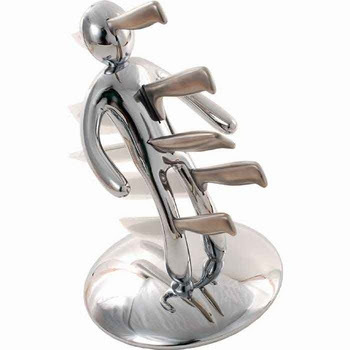 This knife holder is a joke, yes. It makes us laugh in the same way that a Tom and Jerry cartoon cracks us up. But go beyond the immediate visual impact (if you can) and you find a well thought out and practical object. The super-sharp, Molybdenum and Vanadium stainless steel knives are high-quality and keep their edge superlatively. The knives are protected from accidental slicing by plastic sleeves, and are held in place by magnets to avoid unintended ejection. Small plastic suckers on the base of the holder provide an added layer of safety. Comes with bread knife, carver/slicer. chef's knife, utility knife, paring knife. A conversation piece if there ever was one.